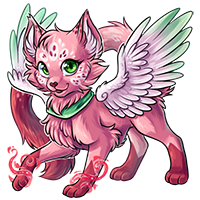 Paizley the Custom Sweetheart Feli has won the Pet Spotlight! Haha, I wondered if someone would pick up on that! Yay! The art for her is absolutely stunning! @Jen late to the party, but congratulations!! Oh and also good ol’ Donoghue v Stevenson ? nice ref! Port sided, green eyed, sweetheart. Too bad its just a fictional cat. I am in love with this overlay *o* The profile, the story and the art are super cute! Congratz on the win Jen! Amazing - Congratulations ! I am at a loss of how wonderful this pet is! Love this pet so much <3 @Jen, if you EVER make her into a CW companion, please let me know. She's gorgeous and I love her story. this is the cutest thing i have seen on here! So Jealous. What a gorgeous overlay! Congrats! I love all the art! Congrats! I love all the art and the profile itself is very cute! Congrats! Whoa what a gorgeous pet! Congrats so very much on the win!